DISCLOSURE | This post is sponsored on behalf of DecoArt. All opinions and ideas are my own. 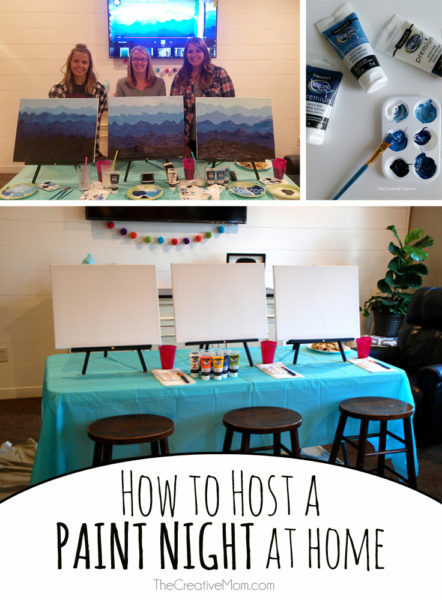 I’m excited to show you how to host a paint night at home. I love getting together with my girlfriends. I am always up for a good girls night out, except I hate dressing up and having to actually wear makeup and all that- haha! My friends and I are always looking for fun things to do besides just the same old dinner out. 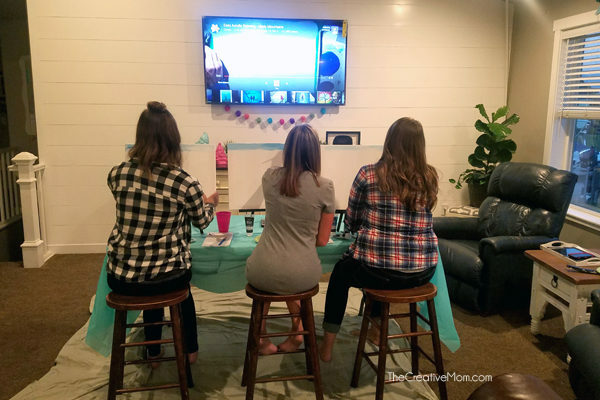 So when it was my turn to plan girls night out, I decided we’d stay IN and host a paint night at home. 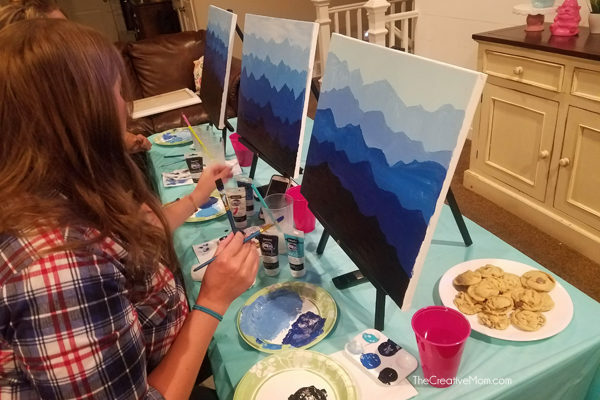 I have been wanting to try going to one of those paint night places, but I felt so intimidated being in a huge class with a professional painter teaching me. So staying IN was the perfect idea. And let me tell you, we had the most fun time together- eating, chatting, and laughing our heads off. It was SO much fun and I would definitely do it again in a heartbeat. 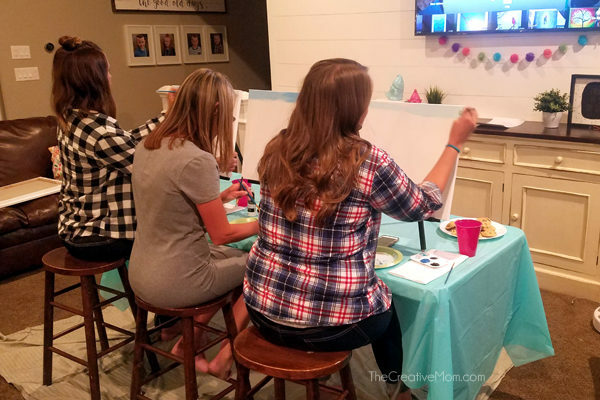 Our paintings turned out pretty good for first timers, but the fun we had was the best part! The hardest part of this whole thing was knowing what paint to use. I knew I wasn’t going to crazy with any fancy art and painting stuff, because I’m honestly not a painter. But I also wanted something that was high quality so it would look good on my canvas. So I was super excited to try the new Americana Premium Acrylic Paints. It’s a mix between regular acrylic craft paint and the pricier, fancier artist stuff. 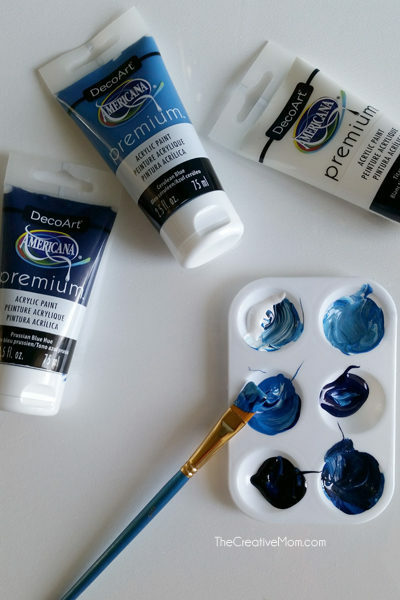 Acrylic paint is one of my favorite mediums to use when I’m crafting and DIY’ing, so I was glad when I found this paint at Michaels and didn’t have to use any crazy oil paints or anything like that. For this project, I used Cerulean Blue, Prussian Blue Hue, Carbon Black, and Titanium White. We used 16×20 canvases. They came 5 to a pack and were on sale for only $10 at Michael’s. 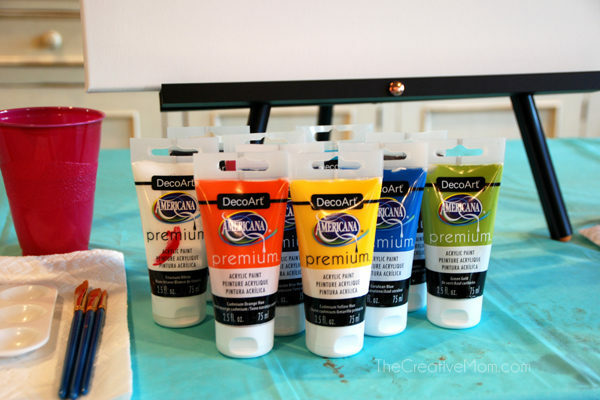 I also picked up a few packs of inexpensive paint brushes, and some little palette trays. If you want to save 99 cents, you could skip the palette trays and just use paper plates. Throw a cheap plastic tablecloth or paper covering over your table and setup a little spot for each person with their supplies and a stool. I also threw an old sheet on the floor in case we spilled paint. We went really low key here, guys! You’ll want your table facing a TV or a computer or tablet with internet connection. Since I’m not a professional painter, I found some cool tutorials on YouTube, and we followed their step-by-step instructions for our painting. It worked like a charm. 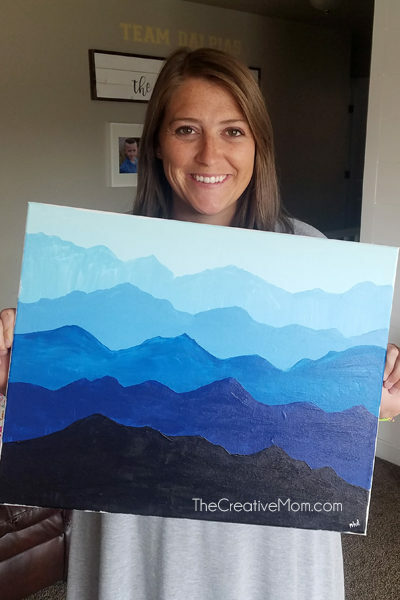 Just google “Paint Night Tutorial” and you’ll find a ton of YouTube videos to follow. 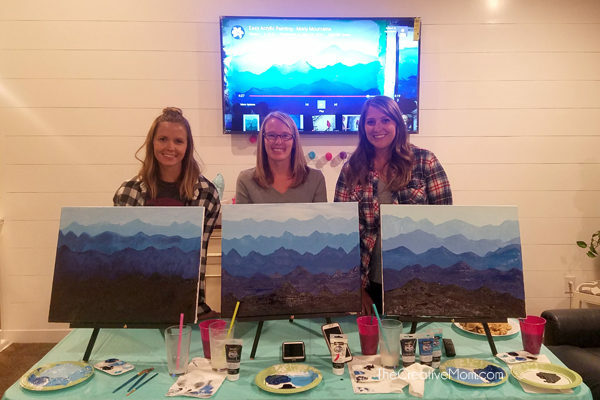 We went for what looked like the easiest painting tutorial for our paint night- you can find it at the bottom of this post. While we painted, we chatted, ate cookies, drank pina coladas (virgin of course), and giggled the night away. I loved that we were able to talk (and laugh) as loud as we wanted, we didn’t have to dress up, and I didn’t even have to call a babysitter- we just put the kids to bed before we started. Having girls night IN, was so much fun. My painting didn’t turn out half bad either. After all was said and done, we were only in about $8 per person for this painting, so even if it turned out bad, it was still less than going out to a movie. 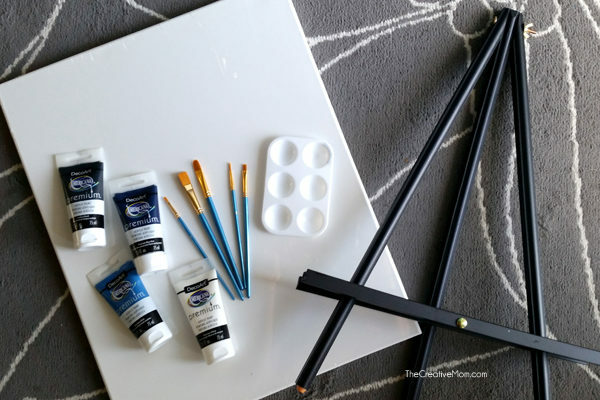 Plus now I have brushes and easels, I can host paint night any time I want- which I definitely will be doing next time I get to plan girls night! Great piece of tutorial thanks for sharing! Great ! Great ! wow What a idea, thanks for sharing.. Your post really takes the stress out of hosting an event like this. I also have wanted to attend something like this and host one as well. Thank you for sharing. Of course, these are not top quality brushes, how could they be for this price? But, wow! For the hobbyist or the person who likes to dabble in all sorts of crafts, this set is over-the-top convenient! A huge assortment of brushes gives choices for all mediums–all in a nicely made pouch. Most of the brushes in the set have nicely trimmed synthetic bristles. Scrutinizing them all, I did find a few that I will trim up a little better. That is not an issue for me–not at less than a dollar a brush. There is a great variety of shapes and styles and bristles. Seems to be good quality bristles and there is a variety of resistance and bend and tension to each brush head. I gave good tugs on all the brushes: Ferrules are tight and bristles do not fall out and ferrules do not come unglued. Finishes on the handles are not marred. All brushes are identified by number. *I received a free sample product from Artify for evaluation/review. Ok, that sounds like an awesome girls night idea! Love! Love!! Love!!! Where did you purchase the easels and what size? Thanks this helped out alot, I am am Ministry Leader for church and wanted to do one for our group.. kinda low budget and so i will try this with my leaders first..
Wow…that is so amazing. I’m think I should try my hand on this. Thank you for sharing tutorial! This looks like a blast! I want to throw a party like this now!! What an awesome idea! 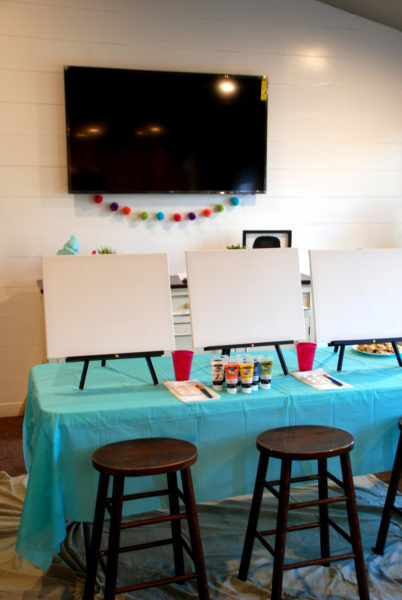 I have been wanting to do a paint night, but this would be fun to have a party at home with some close friends. Now I want to try this. Thanks for sharing! What a fun idea. Thanks for the tutorial!